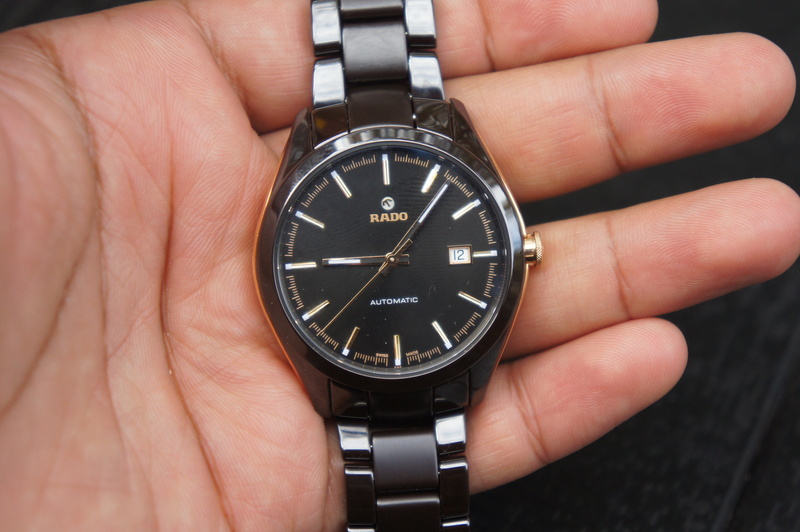 Earlier this year we took a gander at the 2015 range of watches from Rado. A brand that is normally very dress-watch-centric has now started pushing the boundaries of what they can do with ceramic materials, using more modern, sporty designs to highlight some of the material’s features. The 2015 range included the fantastic Diamaster Grande Seconde in plasma ceramic and matt black ceramic. Considering these are the same watch, the change in colour and material changes the look of the watch entirely. The dial details are superb, and the watch wears like a dream on the wrist. This is definitely the pick of the 2015 collection. Here’s the Hyperchrome 3-hander, in the newly developed chocolate ceramic. Brown isn’t really a go-to colour for luxury watches, but it looks spectacular on this model, in both matte and polished aspects, with the gold-coloured highlights really standing out against the darker case and dial. The full ceramic bracelet makes the watch pretty heavy, but it’s a nice, reassuring weight on the wrist. Another notable inclusion for 2015 is the Hyperchrome Chronograph in full plasma ceramic (the grey one). Again, this is a heavy watch, but the mix of matte and polished ceramic finishes, and sporty looks make this a really good daily watch, no matter what you’re up to. Check out the gallery below for more photos of these excellent timepieces.